The alarm went off at 4:00 a.m. but today we weren’t fishing, we were planning to swim with the manatees! This has always been on our wish list so when we found ourselves in Orlando during a cold front we remembered the colder the air temperature the more likely they’ll gather in numbers. The circumstances were perfect. After a few phone calls we chose to book an excursion with River Ventures Tour Center out of Crystal River, Florida. We drove just under two hours when we arrived at our destination. Just like any wildlife encounter we first had to learn the do’s and don’ts of sharing the waters with these beautiful creatures. 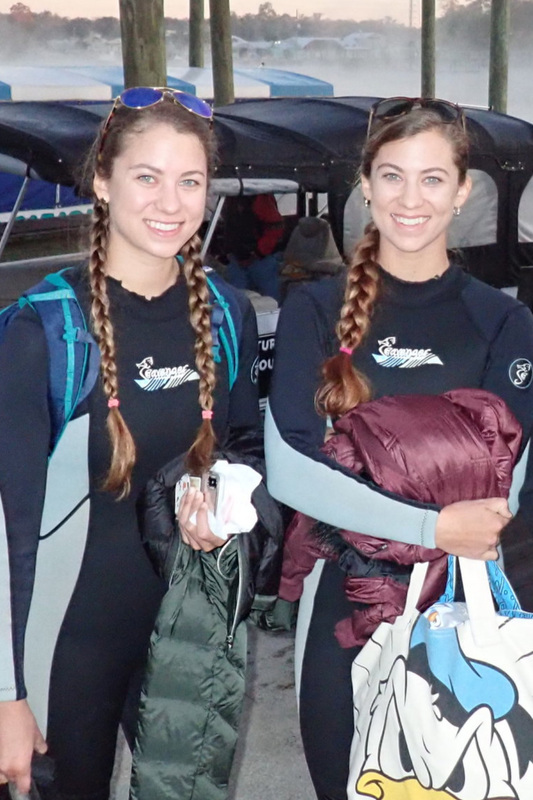 It was 38 degrees, we had our winter coats over our wet suits and we wondered if we were crazy getting into the water. But we were committed! At the dock we were introduced to Captain John Stark and our guide JJ (JJ is also a phenomenal photographer providing us with most of the pictures you see here!). The sun was still rising when we boarded the pontoon and slowly headed towards our destination, a foggy Kings Bay and Three Sister’s Spring. Click here to watch the video or keep scrolling to continue reading! 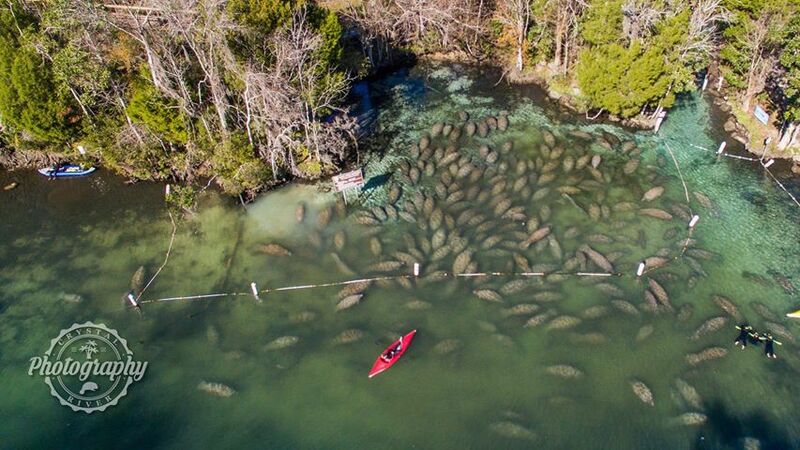 Every winter close to 800 manatees migrate to the warmer waters of Crystal River where the fresh water river stays between 72 and 74 degrees year round. These warm blooded mammals can grow up to 13 feet and weigh over 2,000 pounds. With that much mass you would think they would use their fat to keep warm. However, they do not carry nearly as much fat as you might think so they must find warmer water in the winter in order to survive. We also learned that this particular group of manatees have been studied for some time and scientists have found them to be one of the healthiest groups as their numbers continue to grow. Once we arrived at King’s Bay there was an eerie calm that surrounded us. It was important to remain quiet to not disturb the manatees' routine. As we got into the water, Captain John handed us a noodle to keep under our hips. He instructed us to use only our arms to swim because kicking would stir up the muddy river floor and obscure our view. J.J. guided us towards the manatees where we simply floated and held still. Before long these curious creatures started to approach us. Manatees have poor eye site so once they were comfortable with us in their space, they came to take a closer look. The calmer you are the more you’ll attract them and the likelier they’ll hang around. 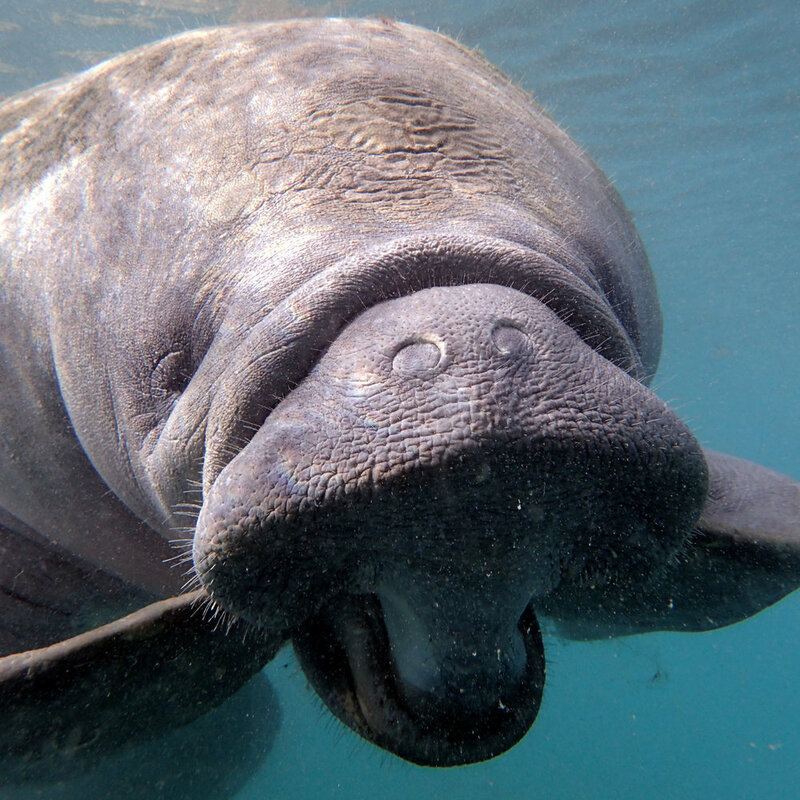 This river is the only location in the State of Florida where touching a manatee is permitted. After initiation from these gentle giants, only then where we allowed to reach out with one hand and become friends. These creatures have a true innocent curiosity about them. They approached us with manatee kisses, asked for belly rubs and back scratches. It was as if we were accepted into their home and they were the perfect hosts. After swimming with such gentle giants for some time the cold water began to cut to our core, it was a friendly reminder that we were in their territory. We said our goodbyes and floated back to the boat taking with us a greater appreciation of these alluring mammals and a renewed commitment to their conservation. Not to mention a memory we’ll share with others for years to come. Back on the boat, Captain John gave us towels, foot warmers, and poured hot chocolate to stay warm. 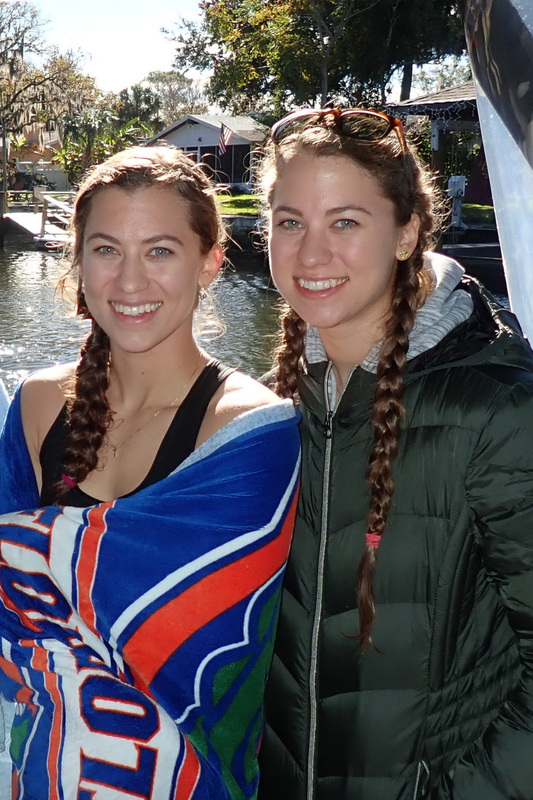 Amanda was so cold that she even accepted a University of Florida towel (Go Canes!). Swimming with these extraordinary creatures was remarkable. We are appreciative to have checked this adventure off our bucket list with the wonderful staff at River Ventures.